Muschamp will be re-introduced at a press conference Saturday, Dec. 13. at 10:30 a.m. at Auburn Athletics Complex Auditorium. 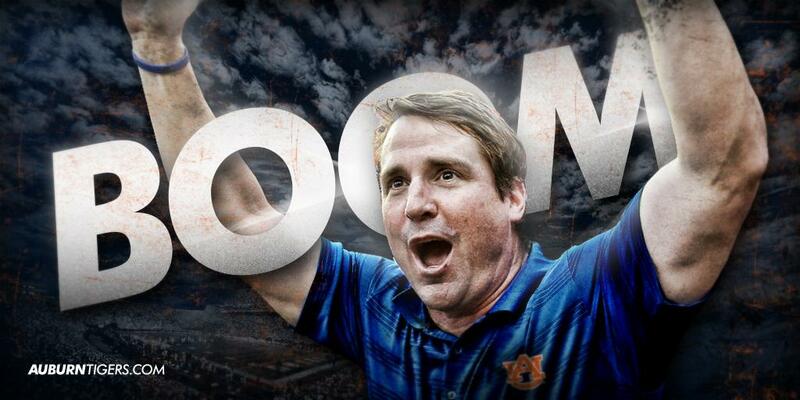 AUBURN—Will Muschamp, one of the best defensive minds in college football and former Auburn defensive coordinator and graduate assistant, has been named defensive coordinator, announced head coach Gus Malzahn Friday. A 20-year coaching veteran including 16 in the Southeastern Conference, Muschamp’s last stint at Auburn from 2006-07 saw his defense ranked third in the nation in scoring defense (15.4 points per game) and fourth in the nation pass defense (170.7 pass yards per game). During the same two-year time frame, the Tigers’ ranked third in the SEC in total defense by holding opponents to 295.1 yards per game and he was a finalist for the 2007 Broyles Award presented annually to the nation’s top assistant coach. “My family, Carol, Jackson, Whit, and I are excited about coming back to Auburn and I look forward to working with Coach Malzahn to win championships,” Muschamp said. Muschamp spent the previous four years as head coach at Florida from 2011-14 after serving as defensive coordinator at Texas for three years (2008-10). At Florida, Muschamp had a 28-21 record and was named the 2012 SEC Coach of the Year after leading the Gators to an 11-2 record and a Top 10 finish. Prior to his time at Auburn from 2006-07, Muschamp served as defensive coordinator at LSU (2002-04; linebackers coach in 2001). Between his positions at LSU and Auburn, Muschamp spent a season with the NFL’s Miami Dolphins in 2005 as Assistant Head Coach for Defense. The Rome, Ga., native has coached in two national championship games in 2003 and 2009, winning with LSU in 2003, and coached in a third BCS bowl game following the 2008 season, when Texas won the Fiesta Bowl. In addition to his national championship past, Muschamp has coached in the SEC Championship Game twice and in the Big 12 Championship Game once, winning all three. In his five seasons as an SEC defensive coordinator, Muschamp’s defenses ranked among the nation’s top 10 in total defense every single year, while always maintaining a top-15 rating in scoring defense, including three times inside the top 10. In four of his eight seasons overall as a FBS defensive coordinator, his teams allowed less than 100 rushing yards per game and has twice led the nation in rushing defense. His 2003 LSU defense led the country by allowing 67 yards per game on the ground, the best mark by an SEC team in the 2000s, while Texas gave up just 73.1 yards on the ground in 2009 to pace the nation. From 2008-10 under Muschamp’s guidance, the Texas defense ranked No. 1 in the nation with 119 sacks. His unit also ranked in the top 10 nationally during the same time frame in other major categories, allowing 2.9 yards per rushing attempt (third), 96.7 rushing yards per game (fourth), 297.4 yards per game (seventh), all of which were Big 12 bests during that span. In 2009, the Longhorns played in the BCS National Championship Game as Muschamp’s defense gave up just 73.1 rushing yards per game, the best figure by any BCS school from 2008-10. The Longhorns also led the nation in 2009 in third-down defense (26.5 percent), turnovers created (37, tied with Ohio) and interceptions (25) as Texas claimed the Big 12 Championship that season. Under Muschamp’s tutelage at Texas, Brian Orakpo claimed the 2008 Rotary Lombardi Award, Bronko Nagurski Trophy and Ted Hendricks Award. In the 2009 and 2010 NFL Drafts, Muschamp had a combined eight players drafted, including seven in the first four rounds and two first-rounders in Orakpo and Earl Thomas. Muschamp’s first full-time coaching experience in the SEC came at LSU as the linebackers coach for one season before being elevated to defensive coordinator from 2002-04. His 2003 defense helped the Tigers to the national championship by leading the nation both in scoring defense (11.0 points per game) and total defense (252.0 yards per game), while finishing second nationally in pass efficiency defense (89.8) and third in rushing defense (67.0 yards per game). The 1994 graduate of the University of Georgia moved immediately into coaching following his collegiate playing career, working as a graduate assistant at Auburn from 1995-96, earning his master’s degree in 1996. He became a secondary coach at West Georgia (1998) and Eastern Kentucky (1999) before moving on to his first defensive coordinator position at Valdosta State for the 2000 season, where he helped the Blazers to a 10-2 record and the Gulf South Conference championship. In his playing career at Georgia, Muschamp earned his way from walk-on to scholarship player by the spring of his redshirt freshman season and eventually was named co-captain for his senior season. He also earned a spot on the SEC Academic Honor Roll in 1993.